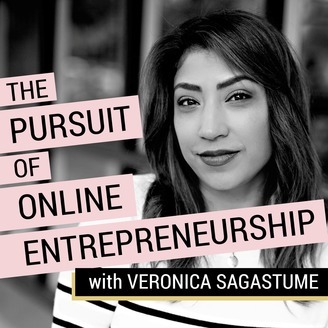 The Pursuit of Online Entrepreneurship is a podcast brought to you by Veronica Sagastume, a business strategist, consultant, and entrepreneur herself. She knows first hand that it takes a lot more than just skill, knowledge and passion to build a business, and wants to help you focus on the right things, while expanding your business to have an online precense to have a greater reach, deeper impact and purpose. This podcast is meant to inspire, motivate, encourage and help you, the Service Based Business Owner (The Consultant, Freelancer, Contractor) navigate the ongoing journey of expanding your business to Pursue Online Entrepreneurship. Veronica’s specialty is taking a business topic, breaking it down, simplifying it and helping you focus to take action, and implement strategies that will get you results. Each episode is an enlightening step forward towards achieving your vision, with actionable takeaways, advice and exclusive resources from Veronica’s treasure trove of experience. How do you define “perfectionist”? Do you see yourself as one? Lots of entrepreneurs get bitten by the perfectionism bug. We do everything we can to grow our businesses, and yet, we trip ourselves up over the tiniest details. We keep ourselves from progressing forward if everything isn’t *just* right . . . And let’s be real: Nothing is EVER just right. So we idle. We put projects on the backburner, and we feel super bummed out when we don’t meet our own ridiculously high expectations. As a recovering perfectionist, I know firsthand the damage this kind of attitude can have on an online business. I also understand where the desire to be perfect comes from—we’re putting our precious work out there online for everyone to see! The internet is forever! It has to look professional! So today, I’m talking to you about my experiences with perfectionism, pointing out the harm you may not even realize your perfectionism is causing, and of course, teaching you how to EMBRACE your imperfections and get the heck out of your own way. I’m on a mission to leave perfectionism in the dust, keep my own business on the up and up, and help others grow their businesses, too, along the way. Care to join me? What Does Perfectionism Look Like? Setting unrealistic expectations for yourself. Getting defensive when you feel inadequate. Your self-esteem is directly proportional to how “successful” you feel. One of the most harmful myths out there about perfectionists is that “perfectionist” is a synonym for “high achiever.” Sorry if this rubs you the wrong way, but that’s not true! See, high achievers are people who push themselves to do great things. Like perfectionists, they value success. But UNLIKE perfectionists, high achievers see the value in the journey. They enjoy making mistakes because it means they’re learning and growing. They use imperfect experiences to fuel themselves and climb to new heights. Perfectionists, on the other hand, get bogged down by their shortcomings and almost always end up achieving less than your typical high achievers because we get in our own way. If you do, don’t worry. I’ve been exactly where you are. For brevity’s sake, I’ll leave it at that, but be sure to listen to the full podcast episode for the scoop on how I realized I was facing a perfectionism problem in my business and what I did to overcome my perfectionism. Look—this isn’t going to be easy or comfortable, but nothing worthwhile is. I broke out of my perfectionism cycle, and today, we’re going to break you out of yours too. Embrace Progress & Push Forward. Reflect on How Far You’ve Come. I know that’s a lot to take in, but you’ve got this! Feel free to bookmark this blog for some quick inspiration next time your perfectionism is getting the best of you, and be sure to listen to WWW.VERONICASAGASTUME.COM/EPISODE29 for a deep-dive into everything we just summarized. I often close out my podcasts with an inspirational reminder to take imperfect action, and today more than ever, that seems like an appropriate note to end on. I hope this information gives you the motivation and confidence you need to let go of your sense of perfection and just start moving forward. IMPERFECTION IS BEAUTIFUL. Embrace your imperfections and get out of your own way today! Now It’s Your Turn . . .
Are you a perfectionist? And if you are (or if you’re a recovering perfectionist like me), how do you embrace your imperfections? 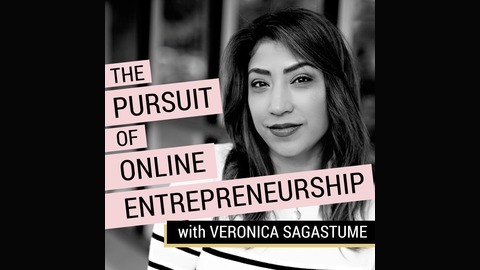 Have you subscribed to The Pursuit of Online Entrepreneurship Podcast yet? If you want to make sure you never miss an ounce of inspiration, that’s the easiest way. You’ll get notifications about each week’s new episode. If you HAVE subscribed and love what you’re hearing, thank you so much! Could you take 20 seconds to leave a review on iTunes? Doing so helps us grow this community, and I personally love reading every single review. I’ll see you next week when we’ll talk about How to Make Money Online With Your Knowledge, Skills, & Expertise. I’m really looking forward to this one and think you’ll get a lot out of it! Thank you for showing up for me, for yourself, and for your business. Bye for now!